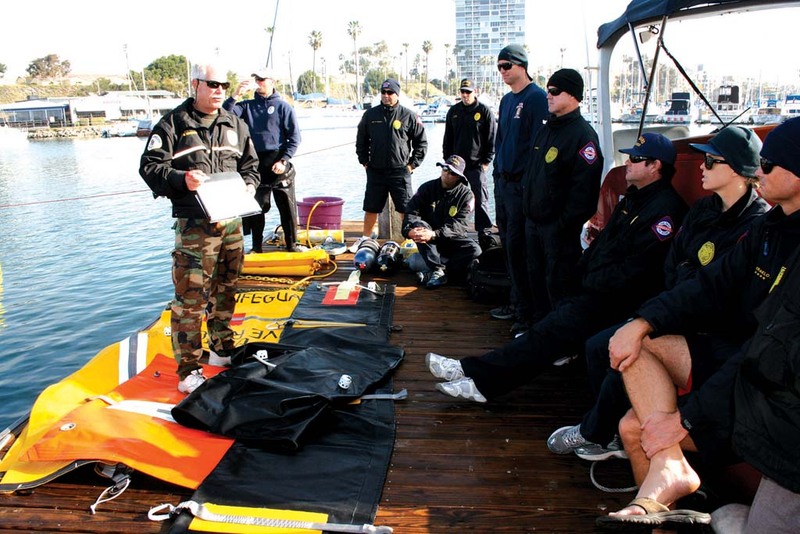 OCEANSIDE — On Jan. 25 a car rolled down the harbor launch ramp and slowly sunk into the murky waters, all in preparation for two weeks of submerged vehicle dive training. Oceanside Harbor Police led 13 public safety agencies through hands-on training between Jan. 26 and Feb. 6. During the five-hour training sessions police, sheriffs, park rangers, Coast Guard crews and Department of Fish and Wildlife officers were taken through on-the-job simulations. San Diego Lifeguards participated in the Feb. 3 training session. Practice included simulated body recovery and lifting the car out of the water. The training is specific to the agency. Law enforcement deals with recovery when the vehicle in question is related to a crime. Their job is to get the vehicle out of the water and collect evidence. Lifeguards take on rescue operations and must determine how to deal with a car that goes into the water. This includes body recovery. Part of the training covers discussing scenarios and best practices. San Diego Lifeguard Sgt. Ed Harris said the hands-on training is very beneficial. San Diego gets an average of one to two calls on a submerged vehicle a year. Harris said the main focus is to make the rescue, keep officers safe and work to keep hazardous fluids from cars out of the waterways. Oceanside also sees its share of submerged vehicles, and has called on its dive team for incidents that have ranged from a driver forgetting to set the breaks on the launch ramp, to a murder weapon being thrown off the pier. Oceanside Harbor Police Sgt. Jeff Brandt said there are only a few public safety dive teams in the county. The Oceanside dive team responds to calls in other cities as part of the mutual aid agreement. Training helps agencies that will respond to an incident go through the steps together. The training sessions are set up to be environmentally friendly. A car was donated by TOWizard, with its hazardous fluids removed. Weights were added to simulate the weight of the car with fluids inside it. The training is part of public safety agencies mutual aid agreement. In future years another agency will lead the training. Each agency absorbs costs for its own personnel time and travel.